Herbs and spices often have amazing health benefits that we may not be aware of. Read more about the different types of herbs and spices available and how to use them as food, flavoring and even medicine. Ginger has a long history as a herbal medicine for preventing and treating a range of ailments. Fresh ginger is also a popular ingredient in many recipes because of its unique flavors and health benefits. I personally love the taste and smell of fresh ginger and a few years ago I was surprised to find out that it’s actually not that hard to grow your own ginger at home. Although ginger loves a humid climate, it is in fact possible to grow ginger indoors as well as outdoors. Read this helpful guide around how to plant, grow and harvest your very own fresh ginger at home. Legalizing cannabis as a medical treatment has been a hot debate for many years. Some consider marijuana an evil drug that serves no medical purpose, while others believe that medical marijuana is a medicinal wonder of nature. Most of us love a good cup of green, white or black tea. Rooibos tea is perhaps not as well known but is just as delicious and also offers some surprising health benefits. Rooibos, Afrikaans for “red bush”, is a broom-like member of the legume family of plants growing in South Africa. Its leaves have been used by South Africans for centuries to make Rooibos tea, or “red tea” as some may call it. Let’s have a look at some of these Rooibos tea health benefits. Herbs are an excellent source of so many nutrients, vitamins and minerals, yet most of us tend to skip them when doing our weekly grocery shopping. 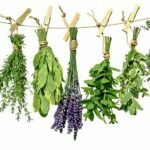 It’s about time we change that once and for all, because herbs offer great health benefits, such as boosting our immune system and fighting off those unwelcome winter nasties. Here are 4 herbs that will help to keep you healthy throughout winter.